Please follow these guidelines for safety and make sure to follow all local laws and guidelines when hiding your GeoPatches! Please do not place GeoPatches in restricted areas or in areas that require participants to cross into/through restricted areas. These areas are commonly marked with, but not limited to, “No Trespassing” signs. By placing the GeoPatch® and reporting back it’s location, you are assuring us you have received permission to place the item there from the land owner or land manager. This pertains to both public and private property. As the owner of the GeoPatch®, you are responsible for determining who to contact in regards to permission to place the item on a piece of property. It is inherently wrong to damage property while placing your GeoPatch®. Please do not dig holes or disturb/deface your surroundings. Please do not alter the surrounding area to lead clues to the GeoPatch® as this violates the rule. It is important to not harm animal or plant life while GeoPatching. Reported as intrusive or unwanted by a land owner or land manager. Is on property owned by, or within 150ft from, a railroad. GeoPatch® seekers assume all risks involved in seeking or placing a GeoPatch®. The GeoPatch® trademark is owned and operated by Smoky Mountain Patch and Supply. Information in the GeoPatch® database is updated regularly. Neither Smoky Mountain Patch and Supply, nor any agent, officer, employee of Smoky Mountain Patch and Supply or any GeoPatching community volunteer warrants the accuracy, reliability, or timeliness of any information and shall not be liable for any losses caused by such reliance on the accuracy, reliability, or timeliness of such information. While every effort is made to ensure the accuracy of this information, portions may be incorrect or not current. Any person or entity that relies on information obtained from Smoky Mountain Patch and Supply does so at his or her own risk. GeoPatching, hiking, backpacking and other outdoor activities involve risk to both persons and property. There are many variables including, but not limited to, weather, fitness level, terrain features and outdoor experience, that must be considered prior to seeking or placing a GeoPatch®. Be prepared for your journey and be sure to check the current weather and conditions before heading outdoors. Always exercise common sense and caution. In no way shall Smoky Mountain Patch and Supply nor any agent, officer, employee of Smoky Mountain Patch and Supply or any GeoPatching community volunteer, be liable for any direct, indirect, punitive, or consequential damages arising out of, or in any way connected with the use of this website/facebook page or use of the information contained within. This website/facebook page is for personal and non-commercial use. You may not modify, copy, excerpt, distribute, transmit, publish, license, create derivative works from, or sell any information, or services obtained from this website/facebook page. Individual GeoPatches are owned by the person(s) who physically placed them and/or submitted the GeoPatch® listing to Smoky Mountain Patch and Supply. 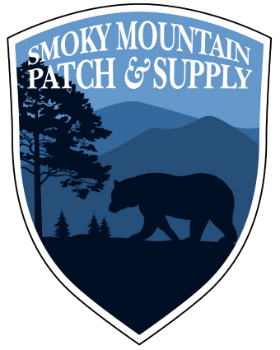 Smoky Mountain Patch and Supply reserves the right to change the terms, conditions, and notices under which this website is offered.